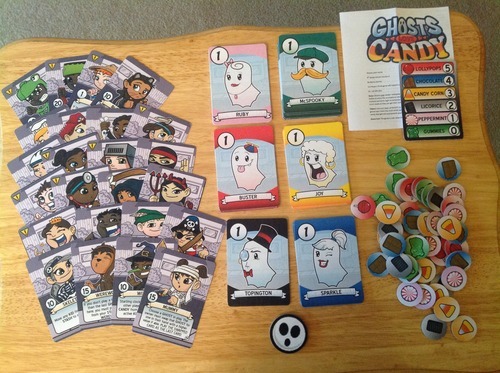 Phil Kilcrease and Danny Devine stopped by to give me an update on their latest game, Ghosts Love Candy – the newest from 5th Street Games. Tom: Where did the idea for Ghosts come from? Tom: That is interesting. I like that idea, the elimination idea. You should pursue that some. That response instantly flipped a switch in my brain, shortly after the title Ghosts Love Candy came to mind and I was off! So the order for this game went Theme, Title, and then Mechanics. Which is not normally how I do things. The mechanics were inspired by Smash Up, the SICK VALUE of the kids and adding towards that to break them is right from Smash Up with only minor adjustment. I have never played Get Bit, but I have seen reviews from it and love how it works, multiple games use the bidding for turn over, but Get Bit inspired me with how simple it was so I built off of that. Tom: My game, Duck Blind, uses bidding for turn order. You’re right. It’s so simple and elegant. Another game I’m working on, Homefront: MIC, has a break-over mechanic similar to the Sick value but with a very different result of course. What have you learned from previous games that you applied to Ghosts? Phil: More refined scheduling of previews with reviewers is the biggest one from the ‘company’ side. Scheduling earlier with reviewers is better for everyone involved. Tom: Yeah, earlier for me is great. Cause I’m so very slow at playtesting and reviewing sometimes. It’s hard to find the right audience sometimes too. Danny: How best to work with a publisher when refining a game, don’t dismiss or get discouraged by changes being made or suggested but at the same time, be honest and open if you feel a rule should stay in place. Basically, be flexible, and communicate your thoughts and feelings, remember your publisher wants your game to succeed even more than you do. I think Phil and I get along great, neither of us are afraid to suggest crazy ideas or stand up for something we disagree with, I couldn’t ask for a better creative partner! Tom: Talk about your playtesting. Anything cool come out of it? Any major changes? Danny is a very good artist. Other designers should consider him for game art. Phil: The main thing that came out of it was the Cheerleader, Grim Reaper, and Angel can be a bit tricky. We’ve managed to tighten up wording in the final version, and managed to catch a special issue in the 2-player mode of the game. Tom: Yeah, my game group had some confusion with a couple of those, Angel in particular. I contacted Danny about it and he mentioned that y’all were already on top of it with the changes. Danny: Early playtests went really well, a prototype came together very quickly and was received well on the very first play through. Something that needed work was balancing the Craving Cards, originally they were seeded semi randomly, the problem was that a few of the cards felt imbalanced, almost like a player had an advantage because their top 2 candies happened to be the bottom 2 on other players cards, allowing for an uncontested dominance for 5 and 4 point candies. A good friend of mine is a mathematician and he helped me figure out a way to balance them, so now if you grab any two craving cards and compare them, they are a lot more even than before. Tom: Balance is SO hard. Too math-y for me. So how did you do it? Let’s say I have a game called, oh I don’t know, Duck Blind. I need to balance the points among the species. 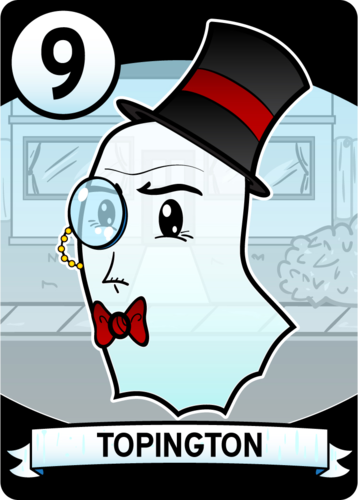 How did you go about balancing Ghosts? Walk us through it. Danny: Like I said, I can’t take full credit there, my buddy Joe is the math wiz! What it basically came down to was making sure players had competition somewhere along the line for candy. There 6 craving cards, and 6 candy types, every candy type appears at each point value exactly once. This example is the clearest to see. These 2 players have no interest in each others top Candy, however, their 4-3 Candy, and 2-1 Candy are in direct competition with each other. The one player is going to take all the chocolates, but will be fighting for his Licorice and Gummies. The other major change was to keep the Craving Cards hidden, at first they were public information which led to a lot of AP and over thinking, the game runs a lot smoother now. Tom: Interesting. I would actually like to play like that to see how it goes. It would definitely add a social aspect to the game. My group would rock that. Danny: It works just fine, as long as you don’t mind the calculations being added up from round to round, it can still be really fun. You’re are about 25 days into the KS campaign. Tell us about how it has gone and any issues that have popped up. Phil: Things are goin’ about as expected. 5th Street campaigns (Smash Monster not withstanding) tend to be about $25K campaigns, and we’re on track to raise that much for the campaign. We’re having fewer cancellations than we did in Mob Town, as well. Tom: The cards in the prototype are fantastic. Who’s doing the manufacturing? Phil: These protos did turn out great. For cards, we now use PrinterStudio.com. Final production will be by Quality Playing Cards, Inc.
Tom: I couldn’t believe they were protos. I believe Dice Hate Me uses Quality. The Kids cards have an amazing amount of powers. How did you come up with all of those? Danny: Once the core rules were down, it was a matter of finding fun way to break them. For the majority of the kids, I started with the Costume then thought about what that would represent. For example, the Black Cat. Black Cats are bad luck when they cross your path, so her power symbolizes that. “When Black Cat gets sick, put her into any STASH” the idea being you are the Black Cat so you make her cross someone else’s path. I honestly have a “logical” path for every cards costume or power regardless of which one I started with. I’ll give you one more. The Dinosaur states “If the DINOSAUR is still active at the end of the game, the last GHOST played here gets 5 points”. Dinosaurs are big and powerful, so he should have a high sich point and be worth something if he doesn’t become extinct. Tom: How is Mob Town coming? Phil: The manufacturer is ready to receive the game once art is complete. Danny and Derek Bacon are workin’ hard to make awesome art (as always), and the rules will need a final review, and then it’s off to the presses. We’re still on schedule for September / October delivery. Danny: It’s honestly going a little slower on my end than I anticipated (Day Jobs, am I right? ), but I am working to get the artwork done as fast as possible while maintaining the quality the backers deserve. Phil: 5th Street? Summer is going to be ship-o-rama for us. We’ve got Smash Monster Rampage, Livestocked and Loaded, & FrankenCrops delivering out to backers. Tom: I really need to pick up Farmageddon. Tom: No hints? No Go Forth exclusive? i am glad there’s more in the queue. 5th Street is a top notch company and there should be people knocking on your door. Phil? I’m still fussing with a John Henry game, but haven’t gotten the mechanics figured out yet. Prolly keep futzing with it in the off time until it finally clicks. Tom: A John Henry game? That sounds cool. Danny? 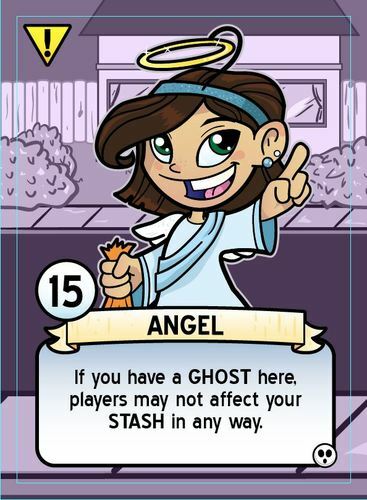 Finishing up artwork for Mob Town and Ghosts Love Candy is the number one thing on my list, and will take some time to do. I have been keeping notes on several other game ideas that I want to make next though. These ideas include a worker placement game where you play as a lazy islander that hires local monkeys to collect fruit from trees for your customers and a bluffing game about Medieval Tabloids attempting to prove the existence of mythological creatures, even if it means lying about it in order to sell more papers. Tom: I want to play that Medieval game really a lot. It is scratching several of my itches. Danny: I will definitely keep you posted! It is always a pleasure talking to Danny and Phil. 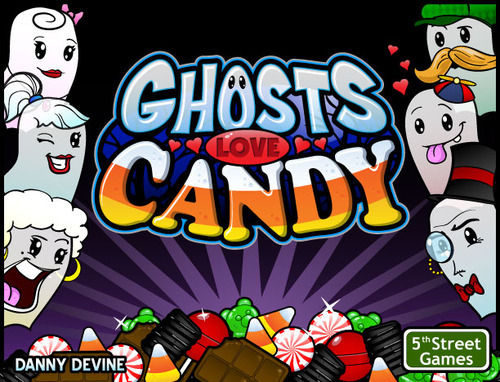 I reviewed Ghosts Love Candy recently. It’s another hit for 5th Street Games. It has six days left in its Kickstarter campaign. Please consider supporting it. It’s a very good, fun game. Duck Blind Gets Released Into The Wild, kinda.